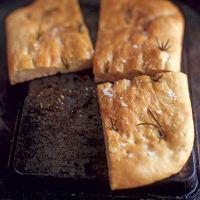 There is a strong suggestion from the Italian term for yeast (lievito di birra) that authentic focaccia makers used beer to get their loaves light and risen. With that in mind, I've added a dash of dark ale instead of malt or sugar here, which will give the crust a ruddy colour. A small amount of strutto (rendered pork fat) would be added in Italy, but duck fat or dripping work just as well, or it can be left out. In a warm bowl, stir the yeast and water and leave for 15 minutes. Measure the flour and salt into a bowl, then the yeast, followed by the ale, olive oil and duck fat, if using. Stir together until you have a sticky soft dough, cover and leave for 15 minutes so the flour absorbs the water. Rub 1 tsp oil in a circle on the work surface and another tsp on your hands and the dough. Loosen the dough from the bowl so it is coated in a film of oil, then lift out. Pinch one end of the dough and fold towards you. Rotate and pinch and fold again, repeat several times and place back in the bowl. Leave to rise for 1 hour. During this time you need to stretch and fold it twice. Pat into a rectangle and fold it in upon itself by thirds, as if making puff pastry, ending up with a rectangle. Preheat the oven to 220°C, gas mark 7, placing a small metal dish of water at the bottom (this creates a steamy cooking environment, ideally suited to baking bread). Oil a 30cm x 20cm roasting tray and lift the dough on to it. Dimple the dough with your finger, then cover and leave for 15 minutes. Stretch and dimple again, so it reaches the edges of the tray. Sprinkle over the salt and tuck in the rosemary. Bake for 25-30 minutes until golden brown. Cool on a wire tray.